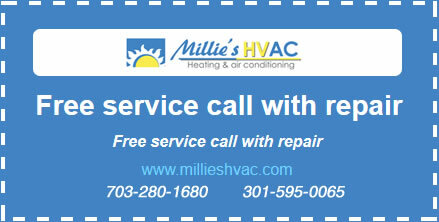 Millie’s Heating & Air Conditioning provides air filtration services to Ashburn, VA and the surrounding areas. We can help you come up with the right solution for your air quality needs, and our NATE–certified contractors can install a whole–home air filtration system that works with your heating and cooling system. From air cleaners to UV germicidal lights, we can help clean the air inside your home with a complete air filtration system. Call today to learn more about the air filtration products and services we offer. If you want to improve the air quality inside your home, Millie’s HVAC can install several different types of whole–house air cleaners to suit your needs. Some air cleaners are more effective at removing particulate matter, while others are better at removing microscopic organisms, such as bacteria and airborne mold spores. While air cleaners are not intended to be used to remove harmful gases from the air, such as radon, they can remove quite a few air pollutants from inside your home. The efficiency of each type of air cleaner will depend on the pollutants you wish to target and the airflow rate as it moves through the filter. Regardless of these factors, proper installation and routine maintenance, such as changing filters often, will help to maintain the efficiency of both the air cleaning system and HVAC system. This will in turn improve the air cleaner’s performance and effectiveness. Call the air filtration experts at Millie’s Heating & Air Conditioning if you have any questions about air cleaners or installing one in your home. The condition of the ductwork inside your home can play a significant role in the indoor air quality. If there is any moisture in the air ducts, it can promote the growth of mold, mildew, and other biological contaminants. Once these are present, then they can get distributed in the air throughout your home when the heating and cooling system is on. Controlling moisture inside your home with a whole–home dehumidifier is one way to help with moisture problems; however, a duct cleaning service could help to locate any problem areas, such as a hole in the ductwork that is allowing moisture to get in. Another effective means of killing harmful microorganisms is to install a UV germicidal light that kills germs, bacteria, and viruses, which cannot be eliminated with standard filters or air cleaners. Call the Ashburn, VA air filtration experts at Millie’s Heating & Air Conditioning any time you need an estimate or assessment of your home’s HVAC system. With proper ventilation, moisture control, and an air filtration system to suit your needs, we can find a whole–home solution to all your indoor air quality problems. Call Millie’s HVAC today to get started.